TagSpaces is a cross platform, open source personal data manager that allows you to organize your files with tags. With the help of tags you can do research better or you can manage projects using the GTD methodology. All tags are saved in the name of the file with no database required. As a consequence, the tags assigned to your files are not vendor locked and can be utilized even without the TagSpaces application. TagSpaces features basic file management operations, so it is a kind of tag-based file manager. You can create and edit notes in plain text, MARKDOWN and HTML file formats. You can organize webpages saved in for example MHTML format. 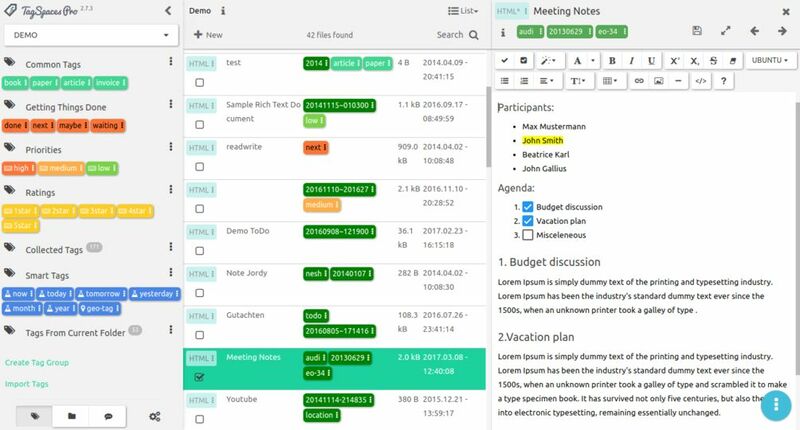 You can create a personal "wiki" for tracking of your projects, idea or memories. Browse your file system in a convenient HTML5 web interface. Currently you can open many common image, audio and video format, but also PDFs or MHTMLs files and the source code of some modern programming languages. The list of supported files types for previewing and editing is constantly growing. This feature makes the Chrome version of TagSpaces a perfect addition to Google's Chromecast, with which your can present your local images, videos and music to your TV.